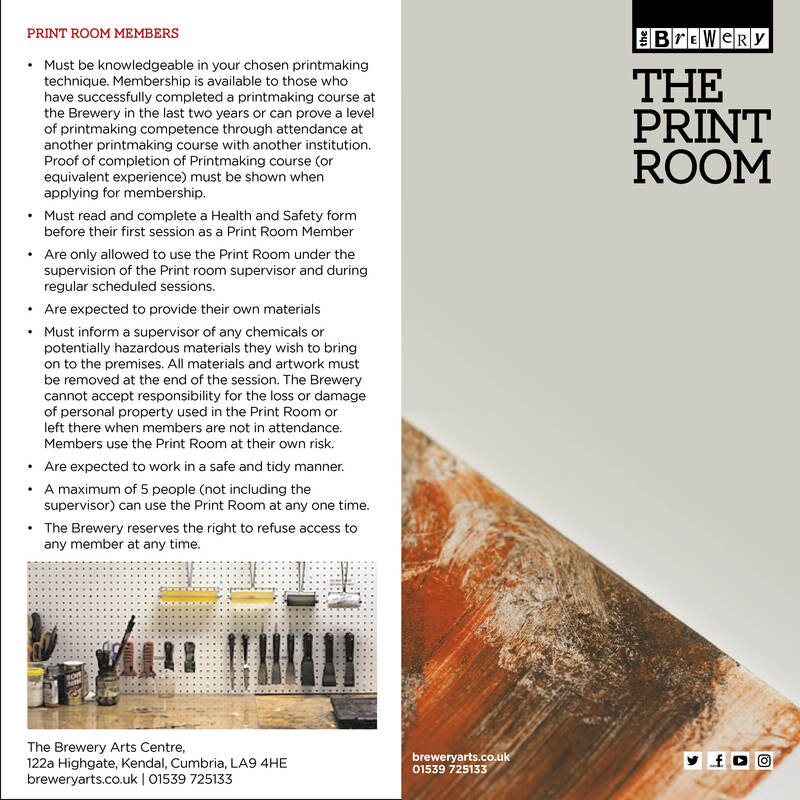 The Brewery Print Room Membership allows experienced printmakers the opportunity to work in the safe, relaxed, and creative environment of the Print Room. Members have access to some of the Print Room’s specialist equipment and will be able to pursue their own work. Autumn term runs from 7 Jan to 29 March 2019. A volunteer supervisor is present at these sessions. Please note that supervisors are not technicians or tutors and any support or guidance they provide is on a non-professional basis. A supervisor must be present at all times otherwise the session will be cancelled. If in doubt, please phone the Box Office (01539 722833) prior to the session to confirm a supervisor will be present. To ensure your safety and to protect the equipment, you must be knowledgeable in your chosen printmaking technique. Membership is available to those who have successfully completed a printmaking course at the Brewery in the last two years or have gained equivalent recent experience. Membership fee is £25 for 3 months or £10 per month, payable at the Box Office. 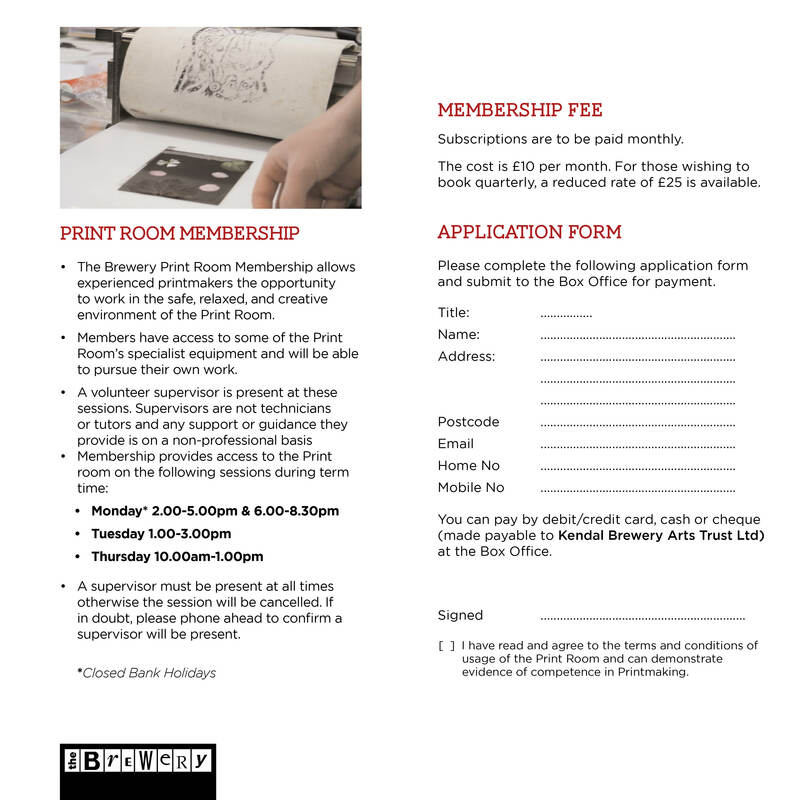 Click here for more on Brewery Print Room Membership. If you are interested in joining any of our Printmaking workshops or courses please click here.